Some of the best Coming-of-Age movie stories are adapted to screen in a manner that makes the viewer feel the same amount of enjoyment as if reading an engaging novel. That’s the case with 1993 film adaptation of Neil Simon‘s Lost in Yonkers. 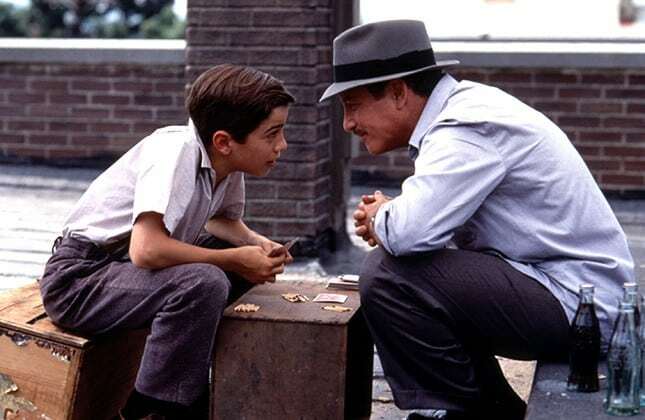 Directed by Martha Coolidge, the film relates the story of the peculiar experiences of two young brothers: 15-year-old Jay (Brad Stoll) and his 13-year-old sibling Arty (Mike Damus). They were sent to stay with their stern German grandmother and childlike aunt in Yonkers, New York in the summer of 1942. 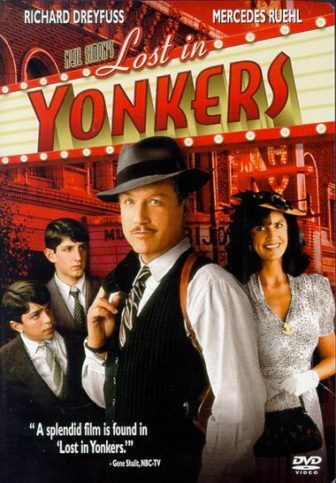 Lost in Yonkers (1993) is predominately a humorous family drama with some insights of human nature and moral lessons embedded in the plot. The humor comes from the quirkiness of the characters and the remarks of the two young protagonists. Based on Neil Simon’s 1991 Pulitzer Prize-winning play, the movie resembles the aesthetic and storytelling of Cider with Rosie (2015), Toast (2010) and John John in the Sky (2000) — especially with regard to perfectionism of picture, sound (in some scenes one gets an impression that a whole orchestra was present while shooting) and nostalgic value. A lot of the film’s appeal comes as a direct result of its immaculate production design and visuals. Location settings are used to both create emotional atmosphere (to a great effect especially in the classical “kids in a candy store” scene) and to recreate the look of America’s 1940s. When it comes to camera placement and cinematography, the filmmakers use predominately the subjective point of view, telling the story through the perspective of the child protagonists thus ensuring that the Coming-of-Age nuances and references are present in abundance. All of the actors deliver impressive (and expressive) performances. Brad Stoll and Mike Damus, in particular, steal each scene in which they appear with impish innocence and charisma. A joy to watch, Lost in Yonkers is a must-see feel-good film with an important lesson: You are the master of your own life! The story of the peculiar experiences of two young teen brothers who were sent to stay with their stern German grandmother and childlike aunt in Yonkers, New York in the summer of 1942.